As early as 1919, doctors began to track a psychological condition among combat veterans of World War I known as "shell shock." Veterans were suffering from symptoms such as fatigue and anxiety, but science could offer little in the way of effective treatment. Although there remains much more to learn, our understanding of war's invisible wounds has dramatically improved. Thanks to modern screening and treatment, we have an unprecedented opportunity to respond immediately and effectively to the veterans' mental health crisis. 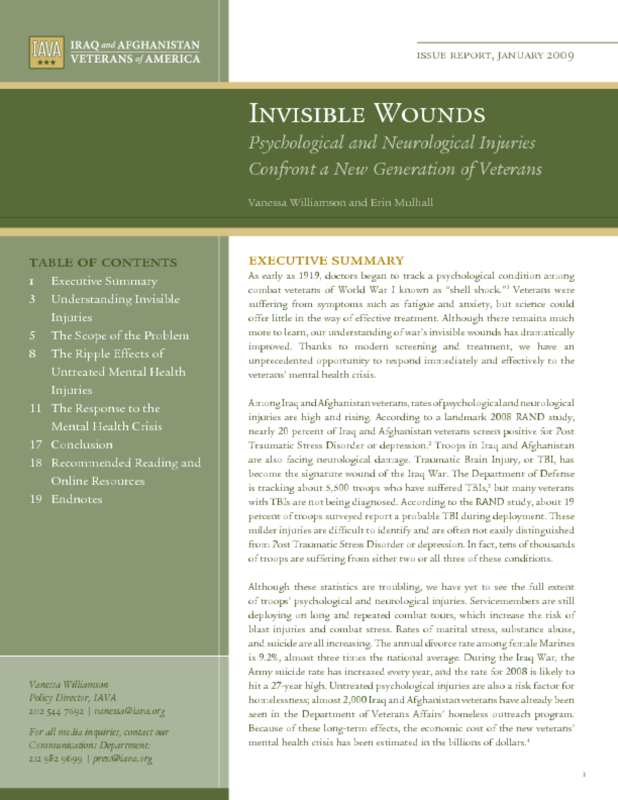 Among Iraq and Afghanistan veterans, rates of psychological and neurological injuries are high and rising. According to a landmark 2008 RAND study, nearly 20 percent of Iraq and Afghanistan veterans screen positive for Post Traumatic Stress Disorder or depression. Troops in Iraq and Afghanistan are also facing neurological damage,. Traumatic Brain Injury, or TBI, has become the signature wound of the Iraq War. The Department of Defense is tracking about 5,500 troops with TBIs, but many veterans are not being diagnosed. No one comes home from war unchanged, but with early screening and adequate access to counseling, the psychological and neurological effects of combat are treatable. In the military and in the veterans' community, however, those suffering from the invisible wounds of war are still falling through the cracks. We must take action now to protect this generation of combat veterans from the struggles faced by those returning from the Vietnam War. Copyright 2009 Iraq and Afghanistan Veterans of America.